Gorgeous flame-haired Cynda Flynn knows fire—its heat, its power, its magic. A fully trained Sybil warrior priestess, Cynda’s weapon is flame. But she’s unprepared for the passion ignited by Nick Lowell, an undercover cop in the NYPD’s Occult Crime Unit. He’s half human, half demon, and hotter than hell, with fathomless black eyes that ignite something buried deep inside Cynda, making her melt in all the right places. Luckily, Nick has found a way to control his dark side, but he’s done it old-school—through steel-willed self-control. And after five years working secretly within the deadly Legion cult, he’s unbreakable. Or he was, until Cynda came along. Now it’s personal—and even his big bad love may not be enough to halt a terrible new evil snuffing out fire Sybils like Cynda. It’s nasty. And if it can’t be stopped, they’re all going to fry. Cynda Flynn is a regular fire bug, because it's her choice weapon. Fire flows through Cynda's veins as true as the blood. She is the pestle of her triad, and will do her part in protecting the innocent. She is always prepared for battle. This time she's unprepared, and it's all due to an undercover cop from the NYPD Occult Crime Unit, Nick Lowell. Nick is no ordinary man, in fact, he's half-demon as well, and hotter than any flame Cynda can produce. She doesn't understand her feelings for him, but she's determined to find out what he has over her. Nick knows how to control his demon half, with a lot of self-control and steel will. He likes to think he's unbreakable, after working with the deadly Legion cult for five years, if the most evil of people can't break him, surely he can't be broken. He learns he's not made of stone, and his soft spot is Cynda Flynn. He's determined to find the evil source that is destroying fire Sybils like Cynda. 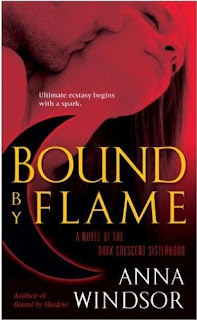 Bound by Flame is book two in the Dark Crescent Sisterhood series, and even better than the first installment. I personally loved Cynda's character, especially her power over fire. Reading about a characters emotions can sometimes be a little confusing, but with Cynda, her flames speak for her. When she's angry, you know it, because half the city can go up in flames around you. It might well be the case if she's in a passionate tussle with one Nick Lowell. Anna Windsor makes a great story, filled with lots of action and just enough romance to keep you interested. I personally had a hard time putting this book down, and would recommend it to all paranormal romance readers. The story of the Sibyl is original, and full of a history of many cultures, all coming together to fight the forces of evil. I honestly can't wait to see how this story progresses in the third installment, Bound by Light, where we will learn the story of Merilee Alexander, the third Sybil of this fantastic triad. Read an excerpt of Bound by Flame here. I received my copy through an online swap site.